NEW YORK, NY (August 9, 2018) – Engagement Labs (TSXV: EL) (OTCQB: ELBSF), an industry-leading data and analytics firm that focuses on the entire social ecosystem and its impact on business, today released its TotalSocial® ranking of the top food brands in the U.S. based on social influence. The analysis is unique in that it combines offline and online consumer conversations and is based on Engagement Labs’ proprietary TotalSocial data and analytics, which continuously measures the most important drivers of brand performance in both face-to-face (offline) and social media (online) conversations. 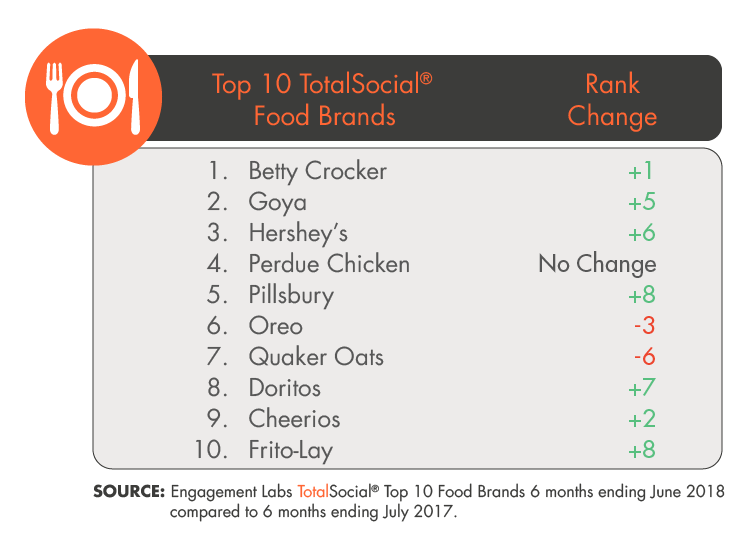 The brands in the top ten have earned the highest TotalSocial scores in the category for the last six months, compared to the Company’s previous ranking in September 2017. According to Engagement Labs’ report, Goya climbed up five spots in the ranking to the number two spot due to an increase in online sentiment and offline influence – revealing that consumers are talking positively about the brand via social media, while an influential group of consumers are spreading the word about the brand in face-to-face conversations. For example, the company’s Goya Gives initiative donated 1 billion pounds of supplies to the people of Puerto Rico after the devastation of Hurricane Maria, which resonated positively with consumers. The company also successfully engaged with bloggers to help generate buzz for meat-free recipes as part of its “Can Do” program with Meatless Monday, which donates food to Feeding America with every purchase. Pillsbury, another company which saw a significant jump in the rankings, moved into the top ten into fifth place from its previous spot at number 13, due to its overall success in sparking face-to-face conversations among consumers. The company successfully engaged with consumers in February when they announced a winner for its "Pillsbury Bake-Off," an iconic baking competition that partnered with celebrity chef and Food Network star Ree Drummond after a four-year hiatus. With all of the ingredients for success, Betty Crocker earned top leaderboard status at number one, up from its previous ranking in second place. However, while the brand climbed in the ranking, its parent company, General Mills saw the steepest decline in its category, falling out of the top ten entirely due to a significant drop in offline influence as well as offline brand sharing, which measures the extent to which consumers are talking about a brand’s marketing campaigns in face-to-face conversations. General Mills has reported a continued slide in sales due to its inability to keep up with changing consumer tastes, as customers opt for healthier breakfast options to replace sugary cereals. The declining consumer interest in sugary breakfast items also had an impact on Quaker Oats, which experienced a drop down to seventh place from its number one spot due to a fall in offline influence and in both offline and online brand sharing, or the amount of consumers sharing the brands’ marketing campaigns via social media.